Both hobbyists and students of design will value this easy-to-use self-teaching book. 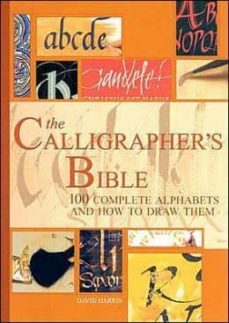 Each of its 100 sections shows a complete A-to-Z calligraphy alphabet, with lessons on correct pen strokes and advice on avoiding errors. Beginners will find sound basic instruction, while experienced calligraphers can extend their repertoire with letter styles that range from classic Roman to clean and elegant contemporary styles. In addition to analysis of each alphabet's features, the book's detailed instruction provides information on Tools and materials  Layout basics  Numerals and punctuation  Illumination and ornamentation  Tips for the left-handed calligrapher . . . and more. Readers will also find examples by master calligraphers from past eras. This book's spiral binding ensures that pages lay flat when opened, allowing calligraphers to study and copy each pen stroke with ease. The Calligrapher's Bible is printed in color and features more than 350 illustrations.